A great co-operative boardgame where Questing Knights battle the dragon, search for the Holy Grail, fend off invading barbarians and destroy besieging engines. Get a group of valiant Knights and Ladies together, a few cups of wine and mead, and together save the kingdom. Just watch out for that Traitor. Days of Wonder don’t release many games, but when they do it’s time to break out the wallet and go grab a copy, because they’re almost always something very special. 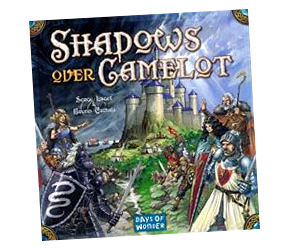 Shadows Over Camelot is no exception. This is one of the very early co-operative games, in which attempt to defeat the game, instead of each other. I had misgivings when it first came out, but of course the game is completely successful. Plus there’s the added spice of one player possibly being a secret Traitor, whose object is to help everyone lose and thus win the game for himself. Days of Wonder really pulled out the quality stops on this one. Not only do you get a main board and three supplementary boards, beautifully illustrated cards and ‘character sheets’, but also thirty nicely sculpted plastic figures to represent your Knights, several Relics (the Holy Grail, Lancelot’s Armour and Excalibur) and a bunch of Siege Engines, Saxons and Picts. Obsessives like me can paint these up to make the game even more attractive. This rules summary includes the Merlin expansion.